By Jennifer M. Wiegand, L.E. The Bahamas Ministry of Health has launched a much needed "Wellness and Fitness Campaign" which if effectively implemented will enable our people to achieve a better quality of life while saving healthcare costs for our government. Often overlooked are fitness recommendations for women during pregnancy. Educating pregnant mothers on how to be "Fit to Deliver" will lower risks for both Mother and Infant. According to an article published in Web MD, "Leading birth defects specialists say maternal obesity during pregnancy puts both mom and baby at risk, and they are calling on health care providers to spread the message. Studies indicate obesity doubles a woman's chances of having a baby with neural tube defects, and even adequate folic acid intake does not fully protect against the increase in risk. Compared with normal-weight women, obese women have a greater risk of developing complications during pregnancy. Their babies are also more likely to be admitted to neonatal intensive care units. Gone are the days when pregnant women were told to take it easy and not do strenuous activity like hanging laundry. Fortunately, we are living at a time of great interest in the fitness industry, including prenatal fitness. In fact, so much research on prenatal exercise has been published lately, that we can now feel confident that we are enhancing our health by exercising during the 9 months of pregnancy. The current guidelines of the American College of Obstetricians and Gynecologists (ACOG) for exercising during pregnancy state that, in the absence of obstetric complications, all pregnant women should do at least 30 minutes of moderate intensity aerobic exercise on most days of the week. This includes women who were not exercising prior to becoming pregnant. The Canadian guidelines go one step further in encouraging pregnant women to exercise by stating that “Women and their care providers should consider the risks of not participating in exercise activities during pregnancy, including loss of muscular and cardiovascular fitness, excessive maternal weight gain, higher risk of gestational diabetes or pregnancy-induced hypertension, development of varicose veins and deep vein thrombosis, a higher incidence of physical complaints such as dyspnea or low back pain and poor psychological adjustment to the physical changes of pregnancy.” ( Can. J. Appl. Physiol. 28 (3): 329-341). 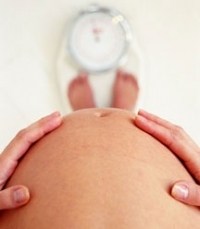 new exercisers should be supervised by a fitness professional who is certified in prenatal fitness. A prenatal exercise class also provides an informal support group where women can exchange thoughts and experiences about the pregnancy. In all forms of exercise, women who are both new to exercise and long-time exercisers need their doctor’s clearance that their pregnancy is normal. Additional benefits of exercising during pregnancy to the mother include increased energy and improved sleep, decreased incidence of loss of bladder control, reduction in pregnancy discomforts such as hemorrhoids, leg cramps, constipation and back pain. Women who exercise during pregnancy return to their pre-pregnancy weight quicker than women who did not and lose less bone density while breastfeeding. Numerous benefits regarding labor have been cited. Regular aerobic exercise raises the level of endorphins, which gives a person the “exercise high” that many avid exercisers crave. In normal labor, the body releases endorphins in increasing amounts to help women transcend the pain of the contractions. The endorphin levels of women who exercised during pregnancy double or even triple during labor, which is why research studies show that there is much less use of epidurals in women who exercised in pregnancy. Studies also show a greatly reduced incidence of cesarean sections in exercising women. The benefits to the baby are also numerous. Research has shown that exercise increases the growth of the placenta which protects the fetus in stressful situations. The stress hormones (adrenalin and noradrenalin) can reduce the amount of oxygen reaching the baby and could even cause fetal hypoxia in labor. However, because the rise of these stress hormones in fit women is blunted, many research studies have shown that babies born to exercising women suffer less stress in labor and are healthier at birth than babies of non-exercising mothers. Dr. James Clapp, a researcher who has done extensive studies with exercising pregnant women, followed these babies through age 5 and found that they scored higher in intelligence tests than other babies. He postulates that the reason is the increased vestibular stimulation, the changes in temperature and the fetal heart rate fluctuations that result from exercising during pregnancy. A report from the Proceedings of the National Academy of Sciences that was published last month noted that, in a study of mice, exercising while pregnant influences the growth of neurons in offspring both before and after birth, with an overall increase in the size of the brain. Weight-bearing exercise during pregnancy has been shown to decrease infant birth weight, while still keeping it within a normal, healthy range. This can be of importance to the mother as many hospitals nowadays will automatically perform a cesarean section if the estimated weight of the baby is 4.5 kgs. and many even recommend a cesarean for babies weighing over 4 kgs. Yoga during pregnancy has also become very popular recently. While yoga exercises do not provide the same benefits that have been listed above that weight-bearing aerobic exercise provide, the gentle stretching and improved body flexibility decrease muscular tension and stiffness. Yoga breathing enhances relaxation which leads to an increased sense of “well-being”. Studies show that women with high stress are at increased risk for spontaneous abortion, preterm labor, malformations and long-term functional disorders in children. Both yoga and aerobic exercise substantially reduce stress in pregnant women. No scientific studies have been done to determine the effects of Pilates exercise performed during pregnancy, though several studies have shown that the stabilizing exercises common to Pilates have reduced back pain and pelvic dysfunction both during pregnancy and after birth. It is important to note, however, that all the published guidelines for exercising during pregnancy (including those of ACOG and the Society of Obstetricians and Gynecologists of Canada/Canadian Society for Exercise Physiology) caution against exercising in the supine position (lying on the back) after the 16th weeks of pregnancy. Most Pilates exercises are performed either in the supine position or prone (lying on the tummy), so the exercises need to be performed in different positions. Many prenatal exercise classes combine low-impact aerobics with body conditioning, Pilates and relaxation exercises for a full workout. Whatever exercise you are doing, keep yourself hydrated, dress in layers and avoid exercising in hot, humid conditions. Do what you can and when you can for a fit, healthy and enjoyable pregnancy. Great Shape/YMCA in Jerusalem and teaches prenatal and postnatal exercise classes. Submitted by Jennifer M. Wiegand L.E.